Standard arm configurations give you maximum breakout force and lifting ability with greater digging performance. 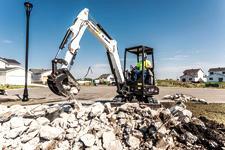 For longer reach and dig depth, equip your machine with the optional long arm (available on certain models). Reach farther from one spot to do more work without repositioning the machine. Load trucks faster and easier with the combination of extra reach and higher dump height. Lift more with greater capabilities enabled by an additional counterweight with the long arm option. If you need even more reach, Bobcat offers the first and only clamp-ready extendable arm option for select compact excavators. It offers the best of both worlds: power and lifting performance, combined with the ability to extend the machine's dig depth and reach when you need it. At times, you need more reach than a standard arm configuration. 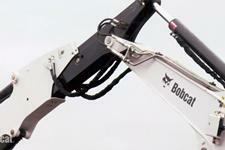 Because we think about what is important on a jobsite, Bobcat provides to you an extendable arm option. You can even use a clamp. Caterpillar®, John Deere®, and Kubota® have extendable arms, but none of them can be used with a clamp. 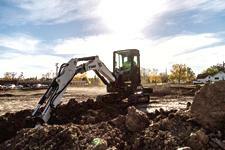 Only Bobcat® excavators give you the most attachment flexibility on your jobsite.